Pro Data Doctor financial accounting management software is designed for small and large business organizations to manage their accounting system in the easiest way. Our Invoicing management utility is a highly automated system for accounting and inventory control with detailed sales and purchase analysis. Easy to use business accounting managerial tool allows you to create and access multiple company records in efficient manner. Billing and inventory control utility with higher quality of business management suit keeps the detailed information about accounts, customers and vendors with whom you deal, items, store center and other related records in real time. Apart from this, Software becomes smarter to keep unit creation and currency converter facility in order to sales/purchase analysis. Integrated accounting software with consistent interface enables you to handle tax related information (such as Bill Sundry, Sale Transfer Form and Tax Type) and maintain other account records in easiest way. Robust and flexible financial accounting software helps business users to maintain expenses and income details of the company with many general business functions including voucher entries and reports. This computerized accounting solution facilitate to maintain sale report, purchase report, stock report, production report, debit/credit note report and other bookkeeping records for monitoring business growth. Enterprise accounting software is equipped with multiple document interface useful to simultaneously view any number of reports at a time. Our fast and accurate billing invoicing utility helps you to make economic decisions related to business in a friendly and integrated environment. Provide facility to manage company accounting system with expenses and income details in financial year. Primary functionality of the software is to create new company records for further process. You can take backup and restore the data for future use. Facilitate with shortcut icons to directly access the records. Facilitate to keep voucher entries including sale/purchase order and register, stock, payment voucher, receipt voucher, journal voucher, production, debit and credit note. Provide facility to maintain Balance sheet report, Trial balance, profit & loss report and other accounting reports (such as Day book, Cash book, Bank book, journal book etc) to evaluate total financial transaction. Facilitate with customized report so that you are able to print and see only required the column in a report. Facilitate to provide User Settings and Admin Settings for higher security. Software facilitates to freeze the date for making non-modifiable records. 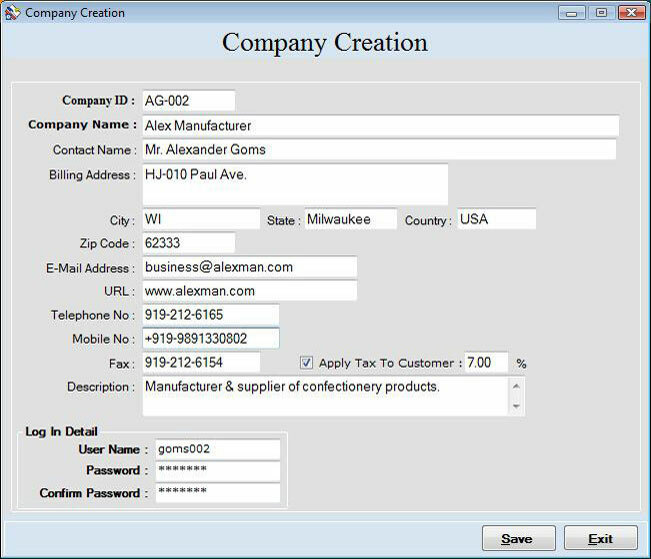 Facilitate with user authentication to open or delete a company record. Provide facility to change the password of company account as per requirements. Data connectivity feature facilitates to fetch company database records from the other computers which are connected to network. Fast and efficient software is useful in different fields like pharmacy, transportation, retailers, real estates, garments, hospitals, aircrafts and many more. Cost effective software is easily understandable by layman users.